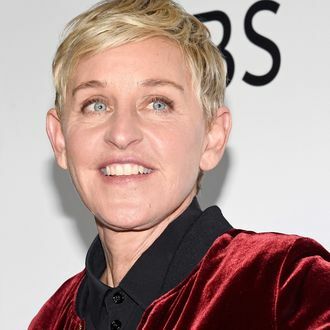 Ellen DeGeneres hasn’t done a stand-up comedy special since launching her daily talk show in 2003, but that’s about to change. Via a no doubt carefully choreographed Twitter exchange, Netflix Wednesday asked DeGeneres if she’d like to film a special for the streaming giant, and she quickly said yes. “It has been 15 years since I did a stand-up special. 15 years,” DeGeneres said in a statement via Netflix. “And I’m writing it now, I can’t wait. I’ll keep you posted when and where I’m gonna shoot my Netflix special. I’m excited to do it; I’m excited for you to see it.” Whenever it happens, it will mark the comic’s first TV comedy special since she filmed 2003’s Emmy-nominated Ellen DeGeneres: Here and Now for HBO. And while it’s newsworthy that DeGeneres is getting back behind the TV stand-up mic after such a long hiatus, what’s perhaps an even bigger deal is that she’s doing it for Netflix — and not HBO. DeGeneres, after all, has a long history with the pay cable network. She taped a half-hour HBO special all the way back in 1992 (as part of the network’s One Night Stand franchise), and then did a pair of specials for the channel at the start of the century. What’s more, DeGeneres’s incredibly successful (and profitable) daytime show is produced by Telepictures, part of the same Time Warner corporate family as HBO. So in addition to a personal history with HBO, there would’ve been corporate synergy involved had DeGeneres opted to return to stand-up via HBO. That said, it would be a jump to assume any sort of bad blood between the comic and HBO. Though her A Very Good Production banner, DeGeneres has been busy setting up a slew of projects outside the Time Warner universe, including three projects for NBC (including the upcoming DeGeneres-hosted Ellen’s Game of Games) and an animated family comedy based on the Dr. Seuss classic Green Eggs and Ham … for Netflix. There’s also this: Netflix is clearly stepping up in a big way to dethrone HBO’s former status as the go-to TV destination for big-name stand-up. The streamer has recently signed deals with Dave Chappelle, Amy Schumer, Jerry Seinfeld, Sarah Silverman, and Chris Rock. DeGeneres’s deal with Netflix seems less about her dissing HBO and more about a desire to stage her comeback at the same place where all the cool kids of comedy are hanging out now. Oh, and Netflix no doubt is paying DeGeneres a ridiculous amount of money, too. Update May 25: On her show on May 25, DeGeneres officially confirmed the special.